Arielle is the star of frag blog Scents Of Self and is also the proprietor of Arielle Shoshana the fragrance store in Washington DC. We have been online buddies for years and even managed to meet in NYC in 2014. One of the loveliest people in the perfume world so I was EXTRA excited when news leaked that she was going to go balls out and create her own Arielle Shoshana in-house fragrance with perfumer Cécile Hua. Imagine you cut open a passionfruit and mix that with the ultra tart segments of grapefruit, add a dash of pineapple juice and eat. The underlying theme that grounds all this freaky fruity frivolity is a creamy amalgam of cardamom, sandalwood and musk. The vanilla doesn’t make itself known to me until well into the LONG life of Arielle Shoshana. A couple of reviews I read didn’t get such awesome staying power but I am fully fragrant nearly two hours later. This passionfruit extract that they’ve found is freaking unbelievable. Almost photo realistic and the fragrance doesn’t really shift a lot until much later when it becomes creamy passionfruit yoghurt underscored by a soft wood. BRAVO Arielle. I bought a bottle and got a USA friend to ship it over for me with some other stuff she was sending, THANKS Ruth! Even in the dead of winter Arielle Shoshana shines. Please jump to Arielle Shoshane<<<JUMP and find a fragrance they sell and ONE of its notes. Put both in the comments below. NO DOUBLE UPS! Entries Close Wednesday 12th July 2017 10pm Australian EdsT and winners will be announced in a separate post. The winners will have till Wednesday 19th July 2017 to get in touch (portia underscore turbo at yahoo dot com dot au) with their address or the prize will go to someone else. Arielle Shoshana – the perfume – sounds absolutely wonderful! I love the passion fruit note in Vero Kern’s Kiki and would be happy to try that promising fragrance, too. Plus: I like the idea that a blogger creates her/his own perfume and now I want (I demand!) a Portia Edp!!! Haha! I follow via email, thank you very much for the opportunity! Yes to Eau de Portia! Oh, I forgot the test: they dell Akkad from Lubin with Lots of Labdanum! If I had the dough I would blind-buy this one just to support Ari. Unfortunately, Mr. Minion needs a new table saw and my perfume budget has shrunk to nil. Anyhoo, I’m dying to try it. I follow via RSS and Bloglovin’ and Arquiste Nanban contains a bunch of pepper. The scent that changed my life and sent me down the fragrance rabbit hole….Tauerville Vanilla Flash ….mmmm Tobacco. And I would buy and wear Eau de Portia BTW. I follow via email and FB! Arielle Shoshana EdP by Cécile Hua 2017 looks like a love for me – sweet and juicy! I follow APJ by email. And one of my favourites is Tauer Perfumes Au Coeur du Désert with patchouli and ambergris. Thanks for the draw! I would love to try this, but more than that thanks for encouraging us to go to her site. I found another fragrance I want to try. (Although my pocketbook may not be happy. Ha ha.). I follow via email, and would list Kai which has gardenia, one of my favorite notes! Amour nocturne, gunpowder. Follow with email. Love, love, love rhubarb notes and have added this fragrance to the “must try asap” list. I see the store carries Smell Bent, of which I have not yet tried any of the line, just one of those things, so I think “Prairie Nymph” with its honey top note should also be sampled soon. I follow you via email. Thank you for the lovely giveaway! The Arielle Shoshana sounds dreamy and exciting with that yummy pasionfruit CO2. And rhubarb! I’m dying to taste, feel, smell that. I follow with email in US. She also sells Lubin Akkad with frankincense. I follow by email. Very exciting that she has developed her own perfume. The notes sound gorgeous. Thanks for the giveaway. No need to enter me in the drawing :). As I mentioned on the last post, this is a wonderful perfume. Absolutely amazing! This sounds Iike a must-try-I’ve not heard of any fragrance with passionfruit-swoon! Parfumerie Generale L’eau de Circe has plum. Yum. CB I Hate Perfume Russian Caravan Tea has Black Indian Tea. I follow by email. i like the AEDES DE VENUSTAS EAU DE PARFUM. note Green Apple. I love that Ari sells Arquiste L’Etrog, suitable in warm climes with vetiver. I have also followed Arianna via social media over the years and was thrilled for her when she announced the arrival of her own fragrance…..And reading your description I’d love to try it. thanks for the opportunity, I follow via Facebook. I will choose Aedes de Venustas Copal Azur and note of salt because I own this fragrance. I follow APJ by email and Facebook. I follow by email. Parfumerie Generale’s Musc Maori has cocoa as a note. Happy to see Ari’s work getting good press here and all around perfumeland. 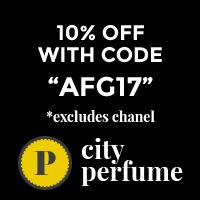 I have a sample so can eagerly say this is a great perfume! Try it even if you don’t like fruity fragrances! I’m trying not to shout! but I can’t help myself! It is just so goooooood! I’m not sure this counts as a note per se, but I want to smell ‘ the sweetness of well-loved books’ in CB I Hate Perfume’s In the Library. Let it be Perfumerie Gemerale Indochine and a note of honey. Would love to try this, I love passion fruit! CB I hate perfume- Black March with the note of rain drops. I follow by email. Amber Flash which has…Amber of course! Thank you for the opportunity. I follow via wp and email. Just wanted to say thanks for getting me back into wearing a fragrance daily after speaking to me about it at Tuesday night trivia. I’ve been getting lots of comments about it from colleagues, friends and the stray boys 😜. A very appropriate fragrance that Arielle Shoshana sells is ‘True Lust’ – who doesn’t want a cuddle. Bernie – the pink shirt boy. It makes me happy that you’re wearing again, and that people are loving it on you. Arquiste Anima dulcis with cocoa sounds great! Thank you! Wish you all the best!